The John-F.-Kennedy High School Art Department offers art instruction for all Middle and High School students. In grades 7-10 we teach 2-D design, 3-D design, including printing techniques, photography, architecture, pottery etc. 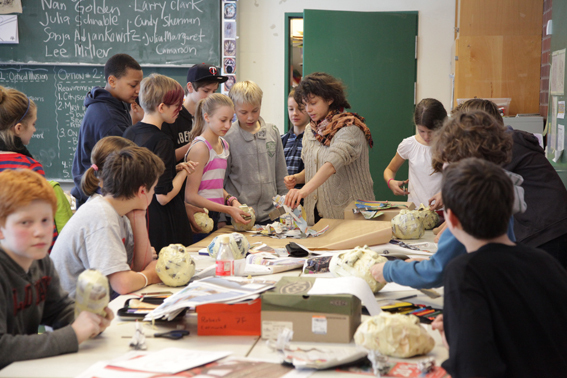 Additionally to the regular classes, students can choose elective art classes starting in grade 8. These classes are meant for students to try out their talents beyond the regular art class they are taking. In grades 11 and 12 we are offering Grund- and Leistungskurs Kunst (German Abitur Program), AP Art History, AP Studio Art and Photography (American High School Program). The AP classes are advanced courses in which students go into the subject matter in depth and take the Collegeboard exam at the end of the year: in AP Studio Art students produce a set of art works which are submitted in a portfolio, in AP Art History the course concludes with a written exam. In the German Abitur program the choice is between Grund- and Leistungskurs. It is the Leistungskurs which is the intensive and more challenging class, designed for those students with a broad interest in art (Visual Media, Architecture, Painting, Sculpture, Photography). Instruction is predominantly in English with the exception of the Abitur-track classes that are taught in German.